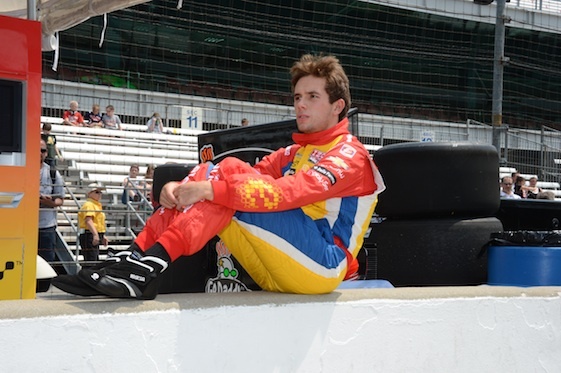 Rookie Carlos Munoz’s comfort level at Indianapolis Motor Speedway increased by 2.14 mph Thursday, when the Andretti Autosport driver re-emerged atop the speed chart heading into “Fast Friday” at the 2.5-mile oval. Munoz, the Firestone Indy Lights point-leader, recorded the fastest lap of the Month of May at 225.163 mph (39.9711-seconds) in the No. 26 Unistraw Dallara/Chevrolet. Munoz’s lap topped the month’s previous best by Andretti Autosport teammate Marco Andretti at 225.100 mph. Andretti, driver of the No. 25 RC Cola Dallara/Chevrolet, was third-fastest on Thursday at 40.0210-seconds/224.882 mph as Andretti Autosport swept the top three positions. Reigning IZOD IndyCar Series champion Ryan Hunter-Reay was second at 39.9990-seconds/225.006 mph in the No. 1 DHL Dallara/Chevy. Scott Dixon, the 2008 Indy 500 champion, was fourth on the chart at 40.0948-seconds/224.468 mph in the No. 9 Target Chip Ganassi Racing Dallara/Honda. Three-time Indy 500 champion Helio Castroneves rounded out the Fast Five at 40.0968-seconds/224.457 mph in the No. 3 Shell V-Power/Pennzoil Ultra Team Penske Dallara/Chevrolet. Friday’s six-hour practice will be the last before qualifying positions are drawn for Saturday’s Pole Day time trials, which will lock 24 of the traditional 33-car field into position for the 97th running of the Indianapolis 500 on May 26. As was the case when he generated headlines on Sunday, Munoz kept the run in perspective. Ambient temperature at 5 p.m. was 83 degrees with a relative humidity of 42 percent and variable winds at three mph. Skies were mostly sunny. Track temperature was 118 degrees, according to Firestone Racing engineers. Munoz was credited with his fast lap right at the close of “Happy Hour” at 6 p.m.
INDYCAR officials confirmed that boost levels for the 2.2-liter turbocharged V6 engines powering the IZOD IndyCar Series will remain unchanged for the 97th Indianapolis 500. As with the 2012 race, the boost level will be increased from 130 kPa to 140 kPa for “Fast Friday,” Saturday’s Pole Day qualifications and Bump Day qualifications on Sunday. The change in pressure adds about a 40-horsepower boost to the engines produced by Chevrolet (twin-turbocharged Chevy IndyCar V6) and Honda (single turbocharged Honda HI13R). The boost level will return to 130 kPa for final practice on Coors Light Carb Day on Friday, May 24, and the 500-mile race Sunday, May 26. Day 6 of on-track activity featured 33 drivers for the first time, as 1996 Indianapolis 500 champion Buddy Lazier made his initial appearance in the No. 91 Lazier Partners Racing Dallara/Chevrolet. Beginning at 5:07 p.m., Lazier added three installation laps to the 2,227 total racked-up during the humid, six-hour session. Lazier will participate in a refresher course before the track opens for practice at noon Friday. Buddy Lazier won the Indy 500, and the 2000 IndyCar Series championship, while driving for team-owner Ron Hemelgarn. Bob Lazier, a veteran of the 1981 Indy 500 and Buddy’s father, said the team’s chassis is the one former Formula One regular Jean Alesi drove at IMS last year with a turbocharged Lotus V6 engine. “We’ve been working on it (chassis) at Ron Hemelgarn’s shop with (crew chief) Dennis LaCava,” Bob Lazier said. “Dennis is the real backbone of this organization right now. Rookie Conor Daly brought out the first yellow flag of the month at 2:19 p.m., when the No. 41 ABC Supply Co. Dallara/Honda fielded by A.J. Foyt Racing made contact with the SAFER Barrier exiting Turn 1 midway through the session. Daly was checked at the infield care center and cleared to drive by Dr. Michael Olinger, INDYCAR director of medical services. “We had just made a change on the springs in the rear,” Daly said. “For me, I felt comfortable the whole time. It’s all been reasonably good. I was just trying to experience a little bit more with the car, and there was a car in front and me. The wind, it feels like it’s been gusting more, and the rear was leaning hard on the outside tire and it just kind of folded over on itself. I just lost it. Just not good. Former Indianapolis 500 winners Al Unser, Bobby Unser and Johnny Rutherford _ who combined to win “The Greatest Spectacle in Racing” 10 times _ are among 2013 inductees into the United States Auto Club Hall of Fame. The Class of 2013 will be inducted during ceremonies Saturday evening before the second annual Hall of Fame Classic USAC Traxxas Silver Crown race at Lucas Oil Raceway in the Indianapolis suburb of Clermont, Ind. Other inductees include Indy 500 veterans Henry Banks, Tony Bettenhausen, Tom Bigelow, Pancho Carter and Jack Hewitt; legendary Indianapolis 500 “roadster” builder A.J. Watson; Indianapolis 500 team-owner Bob Wilke; USAC stock car standout Don White and track promoter/race organizer Earl Baltes. Brazilian Gil de Ferran, the 2003 Indy 500 champion and a former IndyCar Series team-owner, will join the NBC Sports Network team as an analyst during its coverage of Pole Day and Bump Day qualifying. De Ferran is substituting for regular analyst Townsend Bell, who will attempt to qualify for the 500 in the No. 60 Sunoco “Turbo” Panther Racing Dallara/Chevrolet. Bell continues to be enthused about the progress of his one-off ride at IMS. “We’re really happy with the balance, which means at this point we can think about our qualifying setup and optimization,” Bell said. “Our basic foundation is really good, so tomorrow we’ll do some qualifying sims and get things tweaked for Saturday. Joining de Ferran in the booth this weekend will be play-by-play announcer Leigh Diffey and analyst Jon Beekhuis. NBC Sports Network Formula One pit reporter Will Buxton also will join the broadcast team in the pits, as F1 is not racing. This will be Buxton’s first broadcast from the Brickyard. Joining Buxton in the pits will be Kevin Lee, Marty Snider and Robin Miller. Bell took Buxton for a ride in the Indy Racing Experience two-seater Thursday morning for use in a feature during Sunday’s Bump Day broadcast. NBC Sports Network will televise qualifying live from 11 a.m.-2:30 p.m. (ET) and 4:30-6:30 p.m. Saturday and noon-6:30 p.m. Sunday. Thirty-three drivers have been on the track to- date, turning 2,227 laps Thursday and 9,627 laps this month. Justin Wilson, driver of the No. 19 Dale Coyne Racing Dallara/Honda, turned 100 laps Thursday, most of any driver. There were seven cautions for a total of one hour, one minute.